Description: Are you single? Looking for hot singles in your nearby town or city to spend a good time with? If yes is your answer, then datingsa.com is for you. At this website you can meet hot singles situated in any part of South Africa. 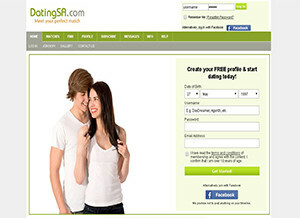 Datingsa.com is a web dating portal that connects thousands of hot singles not only from South Africa but also from different parts of the world. Datingsa.com has thousands of hot singles that match your criteria regarding fun, one night stands, romance, love & even long term relationships. You never know – the person behind the profile you started chat with, might end up in a relationship such as marriage. You can easily make your bio page, choosing your profile picture and adding other contact details & many other hot singles that match your choice. The website provides premium features to its paid members, where they can get the contact details and up to 1000 matches of your interests, age groups & other areas. The website has an excellent gallery feature, where you can see different photos for each profile members. However in order to have a look at them, it is compulsory to become a member, which is absolutely free of cost. The site has a great option of looking for members’ galleries and sending them messages on their private inboxes. There are online chatrooms where singles and those looking for relationships, get together and have a fun time. You cannot visit anybody’s profile if you are not a registered member of this website, in which case it is absolutely free to become one. The premium members can contact other members to get their contact details like zip code location, email addresses and phone numbers. Furthermore you have the option of adding up to 10 photos in your account, as compared to only one in the free account. Ease of use: It is a very user friendly website having no complications to navigate and browse through easily. Once you set up your profile, hot singles are just clicks away to browse for. Currently the website has disabled its online chat room facility in order for regular site maintenance. Selection of profiles: There appear to be no exact counts to the number of people on this website but is estimated to be at least 20,000 to 25,000. Given the fact that South Africa is a small country, the number of hot singles registered is also small. You can search and select others profiles via different categories like Name, Favorites, Likes & Interests, Age groups, fans, keyword search terms etc. This is an added feature not found on much websites and is very targeted to those people interested in real dating. Star rating: Our review would give a high 4/5 rating of the website because of its features, easy navigation, profile selection and many other features. A great website highly recommended for you to visit. Contact details: The Help page has all the contact related information about the website. Since this web site appears to be genuine, the owners try their level best to ensure maximum level of safety and identity theft protection via using proper & secure SSL encryptions. The site has different pages like Terms & conditions, and FAQs to help with the site users as much as possible. If you find any profile fake or abusive, you can immediately file a complaint against it in the “Report Abuse” page. The website has no contact details either than the FAQs and an email query that sends an email to the webmasters of the website.